Authentic music. I wouldn't mind minor mistakes. Folks, let's be real. Let's be authentic on and off stage. Perfection isn't our idol - excellence and authentic performances are. Turn off the pitch correction. Throw out the pre-recorded versions. Give me the real deal. The raw display of what musicians work toward. Maybe we should stop the metronome/click-track with the worship band. Maybe not. Drum loops? Thunder SFX in "Revelation Song?" What do you think? Fake? Or is it a help? Eight years after Sydney hosted what was dubbed "the best Olympic Games ever", officials with the Sydney Symphony Orchestra acknowledged that their stirring performance at the 2000 opening ceremony was entirely pre-recorded. "If you've got an event the size of the Olympics, and you've got billions and billions of people watching it, you definitely have to have a backing track and mime to it, because anything could go wrong," Mr Green said. "It is just a 'safety first' thing. You simply cannot take the risk." I've used several online Bibles in the past. Gateway. Blueletter. Crosswalk. But here's a version that's not only gaining popularity — it's becoming one of my favorite. And they are now up to 31 translations, in 16 languages, and has a great community of users that share their insights. It doubles as my spiritual journal. If you have an iPhone, you can download the app for free. YouVersion…31 Bible Translations…16 languages…1 amazing community! We’re pleased to announce new Bible translations and additional languages for YouVersion.com, YouVersion mobile, and the upcoming 1.2v Bible App for iPhone. Seeing the message of Christ reach all ends of the Earth is a core passion at LifeChurch.tv, and it’s exciting to watch the YouVersion.com community become increasingly global. So…with that…Welcome…Bienvenido…Willkommen…Bienvenue…Välkommen…欢迎…歡迎…Добре дошли…Velkommen…Tervetuloa…Csikszem…Menyambut dengan gembira…Velkommen…Bem-vindo…Bun venit…Добро!!! Yes, I'm addicted to ice cream. 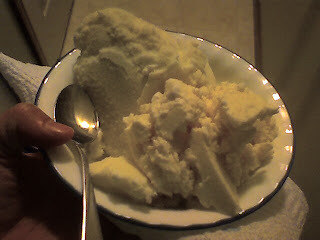 Here was the last of the homemade ice cream from last night. I was sad to see it go. Thanks to my brother at his blog for posting this one. Leave it to my little brother for finding only the best clips. I've seen plenty of apps for the iPhone lately in the music realm. But this drum machine, and its ease of use, got me today. I'm still not shelling out the $2000 (phone + data plan + voice plan) cost over a two year period for an iPhone. I'd rather own a real drum kit. Worshipers can smell a phony from a mile away. That's why when I make a mistake that even the worshipers couldn't ignore, I point it out, laugh about it, and ask for a do over. I've been surprised at the graciousness people give. Worshipers want to know if you are authentic. They only want the real deal. Fake and polished are out. Real and raw are in. I get irritated that CCLI needs an audit of all the worship songs we sing at the church every two years. This means every time we make a master copy, arrangement, and plan a song — it gets recorded. I get irritated because it's pure administration for me to gather and report the information. I understand why it's setup like this. Each song writer deserves the royalties due to them. But let me ask a candid question. "When was the last time someone wrote a song and purposely DIDN'T sign their name — meaning they didn't get royalties, the credit, the fame, or the interest in subsequent songs?" And if this wasn't enough to twang my bud...check out this Olympic sized copyright feud. Peter Breiner, who arranged more than 200 national anthems for the 2004 Olympics, has accused the Beijing Olympic Committee of stealing those works for this year's Games. He says he is "100 percent sure" that his arrangements are being played at medal ceremonies -- and the Washington Post's culture critic couldn't agree more. people worldwide are tuning in to the games via television. they have to purchase the material." I've started following the Church Audio Blog by "JB." Funny, I don't even know his real name. But he had a great post about leadership styles entitled "Ministry Leader, Coach, or Manager?" He talks about being a leader, coach, or manager. I'm not a perfect leader. I used to think one style of leadership was the best — the one that best would lead someone like me. But I've discovered that when I lead, I have to figure out what the situation needs from a leader, then adjust my leadership style to match the situation. I've failed along the way, figuring out that one style doesn't fit all. It's not easy when I'm naturally bent toward a certain style either. Working with artist and musicians — we tend to be more sensitive. This impacts leadership style. Also, it depends on the musician. The cocky guitar player needs firm leadership when a shy vocalist needs more coaching. God help me to know how to best lead Your musicians. Help me lead them as if you were leading them. Creativity. Innovation. Some think it happens naturally. Some think accidentally. But for me, it comes by a purposeful and forceful experimentation. It doesn't come naturally for me. How about you? do you set aside time to be creative on purpose? We have been hanging out with the Hillsong team for the past couple of days. I love that they put such an emphasis on creativity. If you have never seen United live, you are missing out. It rivals any show I have seen. 40-50 foot light wall with 3 video screens…amazing video shorts, and the music, well that speaks for itself. So many creatives are misunderstood. You have to create the right culture for the creative to thrive, and Hillsong has done a good job creating such a culture. In order for worship, business, life, or anything to move to the next thing, we have to move past the current thing, or the thing that has always worked. Sometimes stretching like that freaks us out, but to be innovative, you have to be willing to blow some stuff up and fail sometimes. Here is a faux mac commercial that is killer about creativity. Some of you know that I use Twitter. You can follow me here. I just discovered that almightygod is following me on Twitter. All along I thought I was the one doing the following. In 4 weeks we are getting ready for a "Plugged In" weekend of worship. We've had just about everything else — unplugged acoustic, bluegrass, country, 80's, string section, accordion, and inserting The Who for drum loops. So it's time for a "Plugged In" weekend. Get out your rock kit, Marshall stacks, and crank it to 11. Something to get you in the mood. These videos have been floating out there. I apologize to any Steve Vai fans, like myself, who will enjoy this as much as I do. It's not always good to be the guy on the cutting edge discovering all the new stuff. Would you want to be the first one to figure out which mushrooms were OK to eat? 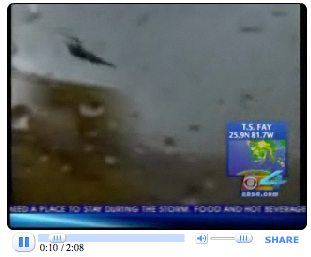 How about this guy who tried to fly a kite for the first time in a hurricane? What about innovation when it comes to the church setting? While we love the cutting edge, it's smart to take calculated risks that aren't going to make you end up in the hospital, out of funds, or turn off the people who worship there. Believe it or not. Saddleback Church is ranked right up there with Michael Phelps' eight gold medals on the Google Trends search tonight. Why? Because people are trying to find out about the Obama and McCain faith forum that took place tonight. Amazing. How would you like it if your church was being searched this much? If it was — what would your church do with it? Imagine what God could do with it. Click here for Google Trends. Here's a humorous look at auditioning for a worship band. I've seen this floating around, and it's still funny. 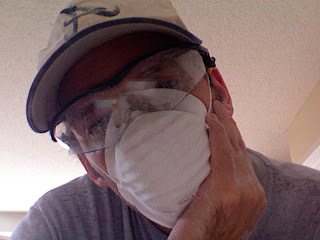 Does this look like a face that wants to sand drywall to you? What does your church need? You may think you know. Maybe you do. Maybe you don't. When it comes to a worship leader, churches are looking for specific criteria. Do you fit it? If not, what are you going to do about it? Before looking at education, skill, talents, or resumes, I would research the integrity of the applicant. Let’s face it friends, the church really doesn’t need more ethical, moral, or financial scandals. Formal musical education could also be a huge plus for those considering Music Ministry. The church is full of talented musicians who can master their instrument yet have no clue how to instruct other musicians and vocalists. An effective leader needs to be equipped to instruct other musicians, arrange the band, assign vocal harmonies. They should have an understanding of music theory so that they can effectively chart new songs and arrangements. Attitude is everything … well, almost. I’ve heard it said in “church world” many, many times, “I’d rather have a good heart than talent”. I've mentioned before that I was heading to a conference in September called Innovate08. Here's a sneak peek at their promotional video. Where is the worship of God headed in the future? This is the question that Tim Studstill, director of music and worship for the Baptist General Convention of Texas, attempted to wrap his arms around. According to this article below — denominations are out, participation is in, and I should have gotten a degree in music therapy. Wish I could fast forward 15-30 years to see what skills I'm going to need today to lead worship tomorrow. Never forgot. You've gotta have skills. WACO (ABP)—Trying to adapt to every trend in worship can become disruptive and distracting to a church, said Tim Studstill, director of music and worship for the Baptist General Convention of Texas. Studstill described several trends that are influencing worship—relaxing the dress code, embracing a more contemporary approach to music and using more technology. Churches also have begun to throw out printed materials such as the church bulletin and the order of worship. Terry York, associate professor of Christian ministry and church music at Baylor’s Truett Theological Seminary, helped conference participants look to the future of the church and what it might look like. Participants predicted denominations no longer will have significant meaning, worship might become less performance-oriented and more participatory, and churches may offer music therapy to individual members, in the same way they offer counseling now. I am talking about temporarily retiring songs that may have lost their luster or have had too much play time. While familiarity is our friend in selecting songs, it can also lead to song abuse. This week someone mentioned, "Man, we ALWAYS sing that song." I looked it up, and he was kind of right. While we didn't sing the song every week (always) — but if you attended our church only ONCE this past year, there was a 1 in 5 chance you'd hear one of these songs. Generate a frequency report of the songs you use. For example, we use a free online service (pro features you pay for) called Planning Center Online. It's an online worship planning tool. One of the fine features even in the free version is generating a report of all the songs we use and the frequency they are used. This comes in handy when you get the regular CCLI audit every other year (dang, those are annoying, but understandable why they have to be submitted). It's interesting that these are all NEW songs that were taught in this past year. When we teach a new song, we sing it 3-4 weeks in a row. If the song sticks well, then we keep it. If it doesn't, it's trashed. We aren't going to permanently retire these. We are simply going to take a nice siesta for awhile. 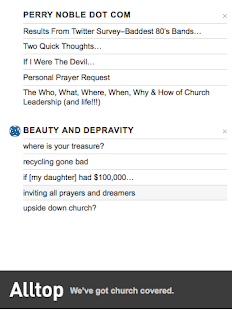 Occasionally, people search for worship leading techniques and land on this blog. For those of you reading this and searching for worship leading tips, maybe this one will help. One thing that has helped me to lead in a worship setting is to ditch the music stand. That's right. Throw it out. It was a crutch for me for a long time. There are great reasons to get rid of it. Head up. Increased eye contact with band. Close your own eyes to remove the distraction of the kid who just threw up on the front row. What do I use in its place? Here's the skinny. There are video monitor screens in the back of the worship space. I know exactly what the worshipers are seeing (or not seeing) at any given time. If you can't install video screen(s) in the back, then go for a TV monitor upstage on the floor. Have a backup (music stand with lyrics sitting behind you) in case the monitors go down mid-morning. I've seen some leaders simply have the music stand there to hold an outline of the order of worship. 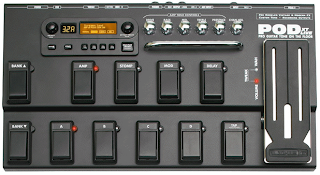 Since I use a Line 6 PodXT Live effect pedal and a Variax 700 electric guitar to lead worship most of the time, I set each song to a pedal on the floor board. I post the following outline for myself so I know which song is coming next, and also which pedal I have assigned to that song. This way I don't have to try and remember, "Now was this with an acoustic setting or was this with a Les Paul bridge pickup setting with slight delay?" *By the way, the tempos and keys are lined up underneath the song titles for me, cause I'm not perfect. Know the basic chord structure of the songs like the back of your hand. It's not going to come just by rehearsing it once with the band and a sound check on the weekend. Spend time by yourself, learning the music. The best way is to play along with recordings. Keep playing and singing until you can anticipate just about everything. Remember, don't practice until you get it right...practice until you don't get it wrong. Memorizing the music is great — but there are still times I have a lapse. I rely heavily on the band to catch my mistakes. There are plenty of times that I'll drop a chord here or there because I was too into the words/worship or simply pulled a "brain fart." Regardless, don't be afraid to mess up — because the other musicians will cover your back. There have been moments that I back off my volume or quit playing and let the band take it. Besides, a good worship leader won't play solid on everything — but play like you really are 1/5 of the band. That's right. You'll need to fail a couple of times without the music stand in front of you to become comfortable how to overcome the crutch of having it there. The more you fail — the more you'll learn to circumvent those failures by recognizing what caused the failure. Hope this helps as you lead worship. It's helped me by getting my head out of a music stand and more focused on the act of worship and making sure others are able to do the same. 1. Recognize inspiration when it strikes. 2. Have a way to capture the inspiration. By the way, nice taped up electronic drum brain. Classy. Instrumental or Vocal: Which do I prefer more? Both instruments and voices are important to each other in almost all of today's worship music, unless you are a Mennonite/Amish or are an avid fan of Gregorian Chant. At the church where I was on staff for the previous 10 years, a cappela music (music without instruments) was repulsive to some in worship because the worshipers came out of a Mennonite/Amish tradition. This surprised me the first time I learned this. I thought they'd enjoy vocal more, but they associated vocal music without instruments with their former lives before they became believers. You've heard me say a million times by now, the WORDS are the most important in evaluating any song. A song can sound great - nice melody and tasty harmonic structure, but the lyrics are what give the meaning to music. Without meaning, the music is amoral - or listeners will associate what they'd like based on past experience with the instrumental music. The words in worship music must have theological integrity, otherwise it will paint a picture of God that may not be accurate with who God is in scripture. Therefore, it's the vocal end that gives life to the WORDS. If the vocals aren't clear, the words won't be either — and the ultimate meaning of the music will be skewed. For example, a vocal group (like Spectral Voices, who records their harmonic singing in a watertower) that uses no words leaves the listener to interpret what one thinks the music means. Instrumental music gives a further expression of the vocal/word part of worship. The instruments give color, create structure, and can bring about emotions (David playing a harp for Saul in the Old Testament). Sometimes instrumental music can lead someone in worship without vocals. For example, when Phil Keaggy plays his guitar - I'm amazed at how God has designed the human mind and hands to create beautiful music. Phil's music causes me to give value to what God can do through instrumentalists. Notice that I'm not worshiping Phil, or his playing, but how God has designed a mere human (Phil) to play. So which is my bent? Well, I'm both an instrumentalist and a vocalist. But I'm a better instrumentalist than I am a vocalist. Because I'm better at playing instruments, it may give the appearance that I have more passion for instrumental music than for vocal music. It would be like saying, "Bryan is better at driving a car than he is at driving a Harley Davidson Fat Boy. His passion must be in cars - not motorcycles." It's not an accurate assesment, because I'd much rather be on a motorcycle. But I'm not a good rider. I am better at driving. The same goes for music. I'm a better player than I am a singer. It's just the way God has designed and equipped me. In short, I value both vocal and instrumental music. I assign more value to the WORDS above the instrumental part of it, even though I'm more gifted instrumentally than I am vocally. A friend of mine mentioned to me that many of the song lyrics used for worship today strike more of a feminine touch, rather than a more manly mantra. Really? Going through our set lists of songs used in weekend worship, I think my friend is right. A healthy balance between the hearts of men and women would be healthy. Regardless of the gender or ages, God desires all people, races, and sexes to connect with their true Creator. Take these next two songs and compare them. I like both songs — but there is a distinct difference. Which one do you resonate with more? Are you a man or woman? Check out this following article (posted on AZ Central, but from USA Today). Churches nationwide are fretting and sweating to reel men into their sanctuaries on Sundays. Women outnumber men in attendance in every major Christian denomination, and women are 20 to 25 percent more likely to attend worship at least weekly. • 52 percent of women and 48 percent of men say they identify with a particular religion, and women are the majority in 21 of 25 Christian denominations, according to the recent "U.S. Religious Landscape Survey" of 35,000 people by the Pew Forum on Religion & Public Life. The survey found 39 percent of U.S. adults - 45 percent of women and 34 percent of men - attend worship at least weekly. What is amazing about this story is the seeming coincidental nature of this baby's birth. Many people use the term "coincidental" because it seems to happen by chance. I believe God allows and directs everything under the sun. If this is the case, then this birth was intentional. As to God's reason for allowing it to happen, maybe we'll never know. What do you think? Do you think people are "lucky" or that God orchestrates everything? FERGUS FALLS, Minn. (AP) -- Hailey Jo Hauer was born on the eighth day of the eighth month in 2008 at 8:08 a.m. So it wouldn't make sense for her to weigh anything other than eight pounds, eight ounces. Lindsey Hauer thought staffers at Lake Region Hospital in Fergus Falls, Minnesota, were joking when they told her the time of her daughter's birth. Then she got a call from the birthing suite noting Hailey's weight. Nurse Jenny Harstad joked that she tried to shrink the baby to 18 inches from her actual 19 and a-half inches. Several hospital staff members said they planned to buy lottery tickets. Yes, it's time to really get rolling. You can't touch this. Get him some oil for his kick pedal. I collect instruments. While I'm not a freak about it, along the way there was a shofar, didgeridoo, and tin whistles added to the collection. 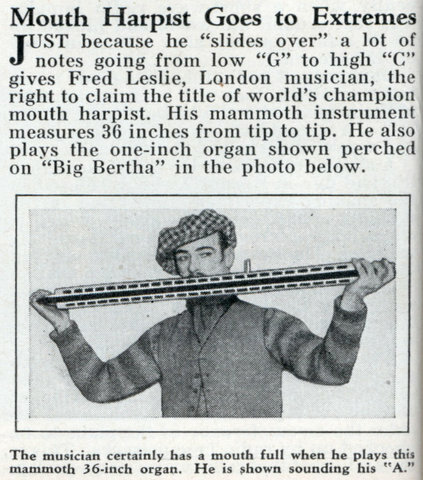 Well, here's one instrument that I'd love to get my hands on. While the Tenori-On seems confusing at first, when it's explained here — seems fun to work with. Submitted for Los' Creative Chaos Thursday. Ever tried to mic a woodwind instrument at the bell. Doesn't work, does it?! That's because most woodwinds (sax, clarinet, etc.) are best miced were the sound emanates - which is the top most opening at the given time. Flutes are best around the mouthpiece, but can be airy. Here is a great read over at emusician.com about mic placement on various instruments based on resonance and radiation. It's complete, including "woof" tones to avoid on a cello. A little physics goes a long way in the recording studio. An understanding of physics doesn't hurt, either. For example, if an engineer knows something about the sound radiation patterns of acoustic instruments, he or she can position the microphone for optimum audio reproduction. Most engineers learn about mic placement through experience, but a little quantitative knowledge can help a great deal. Another area of concern is the resonant characteristics of acoustic instruments. Many instruments do not emit sound at a uniform volume, even when the player maintains a consistent dynamic level. Certain notes sound louder than others because of the resonances within the instrument. However, most engineers don't know the specifics of these resonances, relying solely on their ears and experience to reveal appropriate mic placement and EQ settings. I'm not sure who wrote the following email. It was sent to one of the musicians here at the church. Frankly, I don't want to know who it is — that way I can use it completely for God's glory (not mine or theirs). This is a beautiful picture of how words and music can point someone to God in the middle of a time of worship. This is not something that I (Bryan) can manufacture, schedule, or fabricate. It's all up to the heart of the worshiper — and their response to God. Praise God for working in people's hearts in the following way. Here's what the email said. When's the last time I felt this way about my Creator? When's the last time I EXPRESSED how I really felt this way about God? Here is "Revelation Song" if you aren't familiar with it. This is Kari Jobe singing at Christ For the Nations (Dallas, TX). Alltop Now Covers "Modern Church"
There's a website Guy Kawasaki has been developing called Alltop. The premise of the website is to bring "all" the most important content in a given area to the "top" level. Using mouse hovers, one can quickly catch the current pulse on about any subject. Great concept. A new subject was just added to Alltop that you might be interested in bookmarking. It's called "Modern Church." You can see Alltop's modern church list here. Many of the blog I follow are listed here. You knew it was only a matter of time. Nice job on the tech end on this one.